These are becoming available but software resolution is no match for factory OEM ECU. These are more biased to installing CRD engines in older vehicles. Installation is extremely time-consuming, so labour costs become very expensive. This was mainly for European vehicles, and until around 2004 this was the best option. But for later vehicles the ECU is fitted with a Data counter, which tells the dealer it has been reprogrammed and Dealers can now overwrite the re-program during vehicle services. So the performance map needs to be re-installed after every service. The only way to bypass this Data counter is to open the ECU case and program direct to the circuit board. The MorePower Pocket Flash Programmer was a partial solution to this, allowing the customer to self-install either the standard or performance map. But it needs too many modifications to work on every car. Another problem with ECU reprogramming is that in many cases the performance map being installed in the car is Security-Coded; so even the installer does not have access to the contents, and cannot adjust it. This method of Tuning has been made obsolete by our Multi-Function TB-CRD2-4 range of Tuning Boxes (information further down the page). Which is able to connect & control the same functions as an ECU Reprogram on both Petrol & Diesel engines. We can do either ECU Reprogram or Tuning Box. The Tuning Box is our preferred method as it can be switched on or off, or removed to put vehicle back to standard at any time. 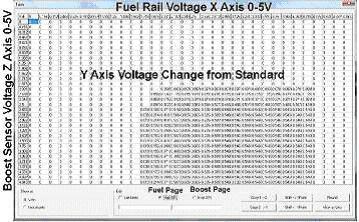 It is also better for creating a custom program because the Data Log stores the individual vehicles running parameters. So if the customer fits something like a sports exhaust, then drives the car for a normal week, we can then read what changed in that week compared to what was in the data before. Where an ECU Reprogram is carried out in an artificial environment - on a dyno at High RPM/Full throttle/Full Load - How often will the vehicle be driven like this? The Tuning Box is the most flexible of the three and readily available in different levels of sophistication. Plus in some cases the Tuning Box you have purchased may be able to be reprogrammed & new wiring loom for your next vehicle. If you sell a vehicle with an ECU reprogram or aftermarket ECU the money spent will be lost. 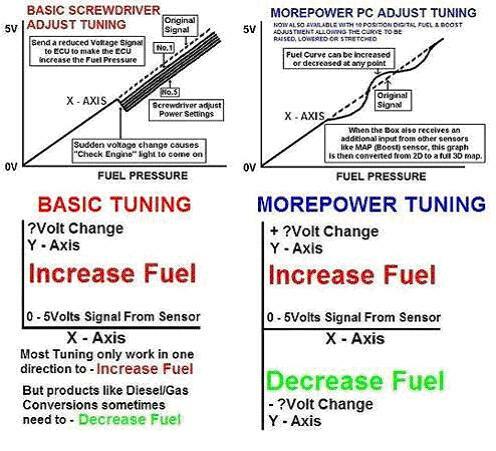 There is an Industry Propagated Fuel Pressure Myth (see extended explanation below) & most surprisingly, the members of the industry who most use this as a selling tool are actually selling Tuning systems which are only supplying more fuel. This is by either making the Injectors open for longer (Duty Cycle) or via the Pressure Sensor & both get the same power gain from the same 10% increase in fuel delivered to combustion. We sell both Injector Duty Cycle & Fuel Rail Sensor Tuning boxes styles as both styles “do work if programmed correctly”, but some engines work better & safer with one style instead of the other, so instead of compromising the Tuning on some vehicles, using the wrong method we sell both. The question which customers fail to ask is what effect does only adding more fuel do to the engines Air/Fuel ratio? It is obvious that you can’t keep adding Fuel & also claim that the Air/Fuel ratio are not affected. It is only possible to add fuel to the point where the Air/Fuel ratio still allows it to burn the fuel. Our solution is to also control Turbo Boost; by connecting to the MAP (Boost) Sensor. Through this sensor we can increase airflow into the engine as well. This allows our Tuning Box to match the Air/Fuel ratio, or in situations where the engine, even in standard tune, runs too rich, we add Boost instead of Fuel. This function can also be very useful in situations like Diesel/Gas where an extra fuel has been added, which can cause potentially dangerous Air/Fuel ratio problems. TB-MP & TB-DENSO covers most of the early Diesels, which have some Electronic control of the pump, but still use mechanical pressure operated injectors, including vehicles like Early Mitsubishi Pajero 3.2L, Toyota Hilux & Prado 1KZ, Landcruiser 1HD, Rodeo, Patrol & Navara 2.8-3.0L motors. Most companies use the same Tuning Box to fit all of these, which are connected via separate wires, and take about an hour to fit. In our range we have TB-MP which is adjusted using a potentiometer type screw. TB-DENSO is a Jumper (like a fuse) Adjust Boxes. This box can also fit VP44 type injection systems, but at Morepower we now only use this type of box on the Toyota 1KZ & 1HD engines. TB-VP44 fits Audi Allroad, Ford Transit, Holden Rodeo, Nissan Patrol & Navara 3.0L, which all use the Bosch VP44 injection pump. Because companies like BMW and Audi also used this pump, there was need of a market leading, high technology product to maximise the potential of the VP44 pump. So we have the Morepower TB-VP44 a Plug-in, 3D, PC Adjust box, which gives us the ability to tune these vehicles in the same 3D way we tune a Common Rail engine, and can be installed in minutes. There is no need to attach any extra wires using unreliable scotch blocks, this system plugs in with OEM Waterproof plugs. TB-PD1 & 2 is designed to fit VAG (VW/Audi) PD engines. These use a system which is the reverse of the older systems, but is now going out of production. They use Electronically Controlled Injectors (Unit Injection), with the fuel pressure being mechanically created. The style of Tuning Box used for this type of injection, plugs to the injector (downstream of the ECU), and controls the amount of time the injector will remain open. Early vehicles use our TB-PD1, which is adjusted using a potentiometer type screw. Our TB-PD2 system is full 3D PC controlled using the same software as our TB-VP44 & TB-CRPD boxes. TB-CRPD Injector (Duty Cycle) Control is a hybrid of the Morepower VAG Unit Injection TB-PD2 box, which is used to control the injectors on full Common Rail engines. There are a few brands of Tuning Boxes, which can do this, but most work on the same parallel-line, Screwdriver or Jumper adjustment method. Our MorePower TB-CRPD box is the only one available with full PC-only, 3D mapping, allowing us to independently increase or decrease fuelling at any RPM or Load point in the map. It is basic mathematics that to get a Diesel engine to produce more power, it will need more fuel to deliver the power. If a dyno graph shows a big power gain at high engine rpm, it can only be achieved by increased fuel delivered to combustion by more than was there before. Both Injector Control & Fuel Rail Sensor Tuning boxes do the cause the High Pressure Pump to run up to 10% higher than standard, But only if the Tuning continues into the high rpm areas of the fuel map. We sell both Injector Duty Cycle & Fuel Rail Sensor Tuning boxes styles as both styles “do work if programmed correctly”, but some engines work better & safer with one style instead of the other. On some engines the weak point is the Injectors, on others it is the Fuel Rail Sensors. So instead of compromising the Tuning on some vehicles, using the wrong method we sell both. Some brands of Injector Control Tuning boxes need to have a wire connected to the accel pedal sensor so that they know when you want to have more power, but this then causes problems with Cruise Control Systems which are not linked to the accel pedal sensor. Our MorePower Injector Control box does not need any extra wires. Our box works out the Engine RPM by counting all the Injector Pulses. Then our box measures how long each pulse lasts, the harder the driver presses down on the accel pedal then the Injector Pulses are longer duration. This then also works exactly the same with the Cruise Control. This covers all boxes, which connect to the Fuel Rail Sensor. This sensor only transmits data related to Fuel Pressure (Ref: Robert Bosch) this is a variable 0-5volt signal. The Tuning Box adjusts this pressure signal by up to 10%, prior to (up-stream) the signal reaching the ECU. It is basic mathematics that to get a Diesel engine to produce more power, it will need more fuel to deliver the power. If a dyno graph shows a big power gain at high engine rpm, it can only be achieved by increased fuel delivered to combustion by more than was there before. Both Injector Control & Fuel Rail Sensor Tuning boxes do the cause the High Pressure Pump to run up to 10% higher than standard, But only if the Tuning continues into the high rpm areas of the fuel map. We sell both Injector Duty Cycle & Fuel Rail Sensor Tuning boxes styles as both styles “do work if programmed correctly”, but some engines work better & safer with one style instead of the other. On some engines the weak point is the Injectors, on others it is the Fuel Rail Sensors. So instead of compromising the Tuning on some vehicles, using the wrong method, we sell both. Most of cheaper versions of these systems are only screwdriver or jumper adjusted, and consists of a parallel-line adjustment, usually up to half a volt below the real signal. If this causes problems, a Screwdriver box then needs to be de-tuned or if possible a PC tune, which adjusts the switch on, and switch off points on the parallel-line adjustment, or moves this line either up or down further. But if the problem is too little fuel at one rpm point and too much fuel at another rpm point, this cannot be fixed with this type Screwdriver type of box. Our Morepower TB-CRD box can fix this problem, it has a full 3D mapping curve, allowing us to independently increase or decrease fuelling at any point in the map. An example of this is the late model Navara D40 2.5L Auto, which runs too rich from the factory. When we tune this vehicle in standard form we give it a slight increase in fuel just above idle, to help the vehicle get moving. Then reduce fuel in mid range to give better cruise economy. Then again increase fuel at top end for full throttle acceleration. This gives good power and drivability and improves economy. Our new MorePower TB-CRD2, 3 & 4 Tuning Boxes contain multiple Map Chips, and have the ability to control different engine functions at the same time. The wiring looms come in a variety of designs, with the ability to plug into and control different engine functions, the same functions as an ECU re-program on both Petrol & Diesel engines. The box can be removed and re-installed at any time eg: services. Just as Diesel engines have adopted previous EFI Petrol technology, now Direct Injection Petrol engines are borrowing the technology of Common Rail Diesels. Most new Petrol’s will be smaller capacity Turbo engines, this will allow a huge potential for Tuning. In 2005, we introduced the first version of the MorePower TB-CRD2 Diesel Tuning Box, which was mapped to run different engine functions like Fuel & Boost Control; with 128 adjustment points per map (current Screwdriver boxes still only have a maximum of 10 points). After testing this early system on Direct Injection Petrol's, we realised that the Petrol mapping required a much finer tuning resolution, so a new style of MorePower Box was created in 2008 with 1024 adjustment points per map as in table below. In 2012 this was further developed to have a fully virtual map system with no fixed grid table boundary. This now has an unlimited resolution & is used for both Petrol & Diesel programs, controlling functions like Cam Angle Sensor, Temperature Sensor, Fuel Rail Sensor & MAP (Boost) Sensor. Some engines now have multiple Fuel Rail or MAP Sensors, which for other companies requires fitting multiple Tuning Boxes. The extra complication with fitting multiple boxes is there is no communication between these boxes. In our system not only does require just one box, but we also choose how all these different Sensors Data is both cross referenced & modified in a similar way to how the OEM ECU functions. With these boxes we have also added external Potentiometer Adjusters (10 levels on each adjuster) for making small compensations for changes dealers have made during OEM ECU updates. Depending on the vehicle type these boxes come is 3 types. First has a single adjuster for global (all systems) settings. The second has twin adjusters, with separate one for peak Fuel & Boost. The third type has three adjusters for separate Fuel, Boost & Map Timing. In-built Temperature sensor which reduces tuning on cold engine (vehicle needs to warm prior to Dyno Tuning). DPF Particulate filter regeneration detect, which reduces tuning during this cycle. 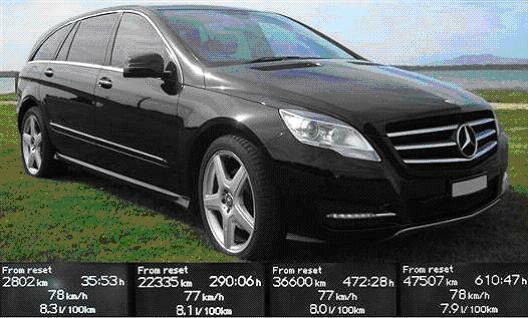 Data-Log system which in real time, stores all information the box receives from the cars sensors. Plus - how often the box did get power even if engine was not started, eg: Ignition On. How often the engine started with box plugged in. How long the engine ran with box each time. The date of the first programming of this box. How many times the box has been reprogrammed. The date of the last programming of this box. The biggest problem with most Tuning Systems is that they use the same generic box and program on many different cars. But this is then a compromise on all of these cars. For example, even though a Hilux has the same engine as the Prado, the Prado has an intercooler, so it has different air temperatures; this requires a different fuel map. The Screwdriver Tuning systems claim to be directly transferable between totally different vehicles (no additional programming required). And yet also claim to be individually tuned to suit different vehicles. Screwdriver adjusted boxes do not properly compensate for modifications like exhaust, as we find that only certain parts of the map need adjusting, not the whole map moved up or down, so deciding which direction to turn the screw will always result in a compromise. Many companies sell tuning systems, but only plug to one sensor or just to the injectors, so in both cases only control fuel. Some companies are starting to see the need to add boost as well to balance air/fuel ratio, but still only run 2d maps. The Morepower Tuning box is the only Tuning system which plugs to multiple sensors, controlling multiple functions with full 3d resolution. It is the most sophisticated system developed for these engines. You must also note that all power gains listed were achieved on standard vehicles, with no other modifications. So the systems are also a “stand alone” modification, which when combined with other products, achieve further gains. If you plan to install a performance exhaust, the program we install in the box will be different to our standard program. Screwdriver adjusted boxes do not compensate for modifications like exhaust, as we find that only certain parts of the map need adjusting, not the whole map moved up or down. Eco programs are biased towards Fuel Savings. The Fuel curve is designed to improve torque from less use of the accel pedal, this encourages the driver to not use Acceleration Enrich Mode. The Box can be set to switch off completely at full throttle, so it is not possible for the vehicle use more fuel than standard. This style of program is popular with Courier and Trucking companies, where the vehicle has been chosen well to do it’s job, but they would like to reduce the running costs, especially when the owner is not the driver. Towing programs are designed to increase torque, and to sustain the torque curve as high up the rpm range as required. But the focus of this style of program is vehicles traveling long distances at the same road speed, but under load. Having the correct fuel at this speed, encourages the driver to not need to use Acceleration Enrich Mode, and can save fuel if driven correctly. Full throttle fuel can be increased as well, or switched off like in an Eco program. 75% of our programs are based on this style. Rally programs are designed for light weight performance vehicles. An engine with this style of program is constantly using most of its rev range. These programs are not suited to loaded vehicles travelling at constant highway speeds. But this style of program is still popular for city drivers with the new generation, performance Diesel cars. Only a person, who is qualified, is permitted to tune our late model Morepower Tuning boxes with a PC. This is why our shops will not supply a Tuning Box off the shelf. All of our shops order boxes as required, and tuned to match your vehicle modifications. We have created different maps to match modifications like larger exhausts, larger tyres, LPG systems etc.. All of the Morepower PC adjusted Boxes also contain a Data Log function. So if the customer makes changes to the vehicle, they can run the vehicle for about a week after the modification, and then post the Tuning Box back. Our Morepower technician can read the change to the vehicle from the Data Log, and from this information, can make program adjustments, this process can cost $50 - $100, depending on time required. Some vehicles are being used to carry enormous loads; we have seen 118kw Nissans carrying over 5tons. Once you calculate the combined weight of a fully stocked large caravan, the roof rack load plus what is inside the vehicle even the accessories fitted to the vehicle like bulbar & winch. Then we have to also calculate for additional load caused by the gear ratio changes caused by oversized tyres. It is fairly obvious the program to tune a vehicle in this situation has to be very well balanced & matched to these vehicles requirements.